+2/+0 while you have no cards in hand. Covenant Marauder is a rare Strength creature card. It is part of the Core Set. "Nothing will hold me back." "It's a good day for battle." 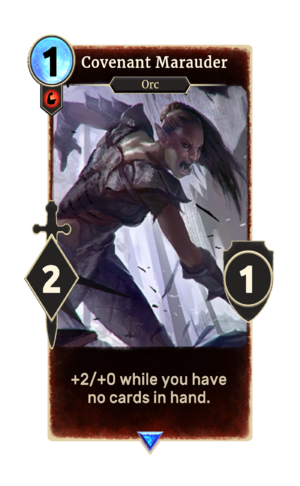 This card's ability applies the Covenant's Wrath card effect. The Covenant Marauder is named for the Daggerfall Covenant, one of the three alliances that partook in the Three Banners War. This page was last modified on 13 February 2019, at 23:43.